Recover quickly after a setback when your emotions are intense. Emotionally intense people have big reactions to things. It is normal and healthy, and sometimes disruptive. Whether it is a new date, a mediocre performance review at work, a challenging family event, surprising jealousy over a friend’s good fortune, or a bad day in world news, your emotions are heightened. Self-regulation can be challenging in the immediate aftermath of an emotional event. When you need to process emotions quickly because your to do list is long or your other priorities have to be attended to, a quick coaching session may be just what you need. 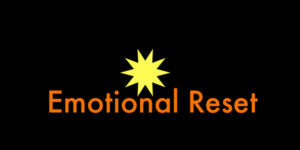 In these Emotional Reset sessions, I help you honor your emotions fully and move into action. When you are highly emotional, especially when emotions are connected with fear or stress, you don’t have access to the wisest or most productive parts of yourself. Coaching is a powerful way to reduce fear or stress, which then allows the emotions to flow through you and shift into more manageable forms. Using techniques from cognitive and somatic schools of coaching, I help you access your inner psychological resources, calm your physiological responses, and increase your capacity to be in action while having an emotional experience. When you buy this package, you will receive a link to schedule your sessions. Schedule them at your convenience, as often or as far apart as you need. If it’s a really bad month, you might use 3 or 4. If it’s a good quarter, you may not need any, but it’ll be nice to know you have the option. These packages have no expiration date. Is 30 minutes really enough? Yes, if we skip the chit-chat and get right down to business, it is. This isn’t therapy. We aren’t going to unpack why you had the reaction you had. We are going to accept what is and figure out how to get you moving. What if I have a mood disorder, anxiety, or depression? This may or may not be a good fit for you. Email me and give me a sense of your availability and we will set up a time to discuss your situation. Not for this package. If you are concerned about whether it will be worth your money, request a free sample and see what we can accomplish together. I’m not sure. Do you do a free sample? Of course. Email me and give me a sense of your availability and we will set up a time. Kate is a phenomenal coach who intuitively recognized what I needed to get out of my shell and into my full, authentic expression. Experiencing Kate’s fun, unique exercises were like unwrapping Christmas presents every week! Her coaching guided me to a remarkable transformation from timid and fearful to the bold, brave, “real” me who shows up and plays the game. I now have the courage and confidence to speak and present myself in ways I only dreamed of. I positively recommend Kate’s program if you want to be the star of your own show.